Review: A highly limited RSD 45 taken from Ford's debut album on Spen's Quantize. "Here You Are" is an unabashed throwback to classic jazz sentiments and signatures; smoky, yearning and barbed with just the right amount of heartache. Flip for a remix from a true disco legend John Morales. With an editing, extending and remixing reputation that pre-dates even reel to reel machines, his M+M touch to "The Best Of My Love" is as polished and shiny as you'd want it to be. Review: A quick glance at the epic list of credits accompanying this Su Su Bobien single confirms its impressive musical credentials. 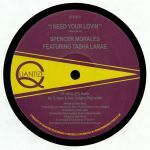 Produced by DJ Spen, Thommy Davis and Michelle Chiavainni, it's a cover of Loleatta Holloway disco classic "Love Sensation" featuring specially recorded strings, horns, drums, bass and guitar. It's pretty faithful to the Salsoul original all told, even down to Tony Montana's string arrangement, though it does feel a little looser, warmer and groovier than Holloway's full throttle take. The brilliance of Bobien's vocal is confirmed by the flipside acapella, which boasts just the right amount of delay and reverb to get the hairs on the back of your neck standing to attention.